Managers have been fired in baseball since the beginning, so that the Brewers would let a manager go in 1912 is not a big story. But very seldom was the situation aired out in the press as this story was. We end our "100 Years Ago In Brewer History" articles for 2012 with the Hugh Duffy/Milwaukee Brewer Management Story. Hugh Duffy had been hired as the Brewer manager by owner Charles Havenor in November 1911 to replace Jimmy Barrett, who had resigned. Duffy had managed the Milwaukee American League entry in 1901, and the Western League Milwaukee Creams in 1902 and 1903, winning the Western League pennant in 1903. Since then he managed the Philadelphia Phillies three years, then two years in Providence of the Eastern League. (Duffy owned a third interest in the Providence club, holding it until December 1911, when the club was sold for $72,000; $10,000 going to Duffy.) In 1910 Duffy took over the reins of the Chicago White Sox, and managed the Sox again in 1911. The White Sox of 1911 had a record of 77 and 74. There were stories throughout the year that owner Charles Comiskey had been unhappy with Duffy as his manager. On October 23 the Chicago Tribune announced that according to reports from "unquestionable sources" Chicago native Jimmy Callahan was to manage the White Sox in 1912, and Duffy would take over the Des Moines "farm" club for the Sox, having a controlling interest in the club. Duffy's job would be to train and develop young players for the White Sox. The next day Comiskey confirmed Callahan as his new manager, however, admitted Duffy had not made up his mind to accept the Des Moines position. A report out of Boston said Duffy had resigned his job in Chicago after a contract had been offered him, while others were saying he was disposed of. Sporting Life reported Duffy left Chicago with poor grace, as he thought that Comiskey should have retained him for another season in view of the White Sox victory over the Cubs in the fall Chicago City Series. Whatever the true reasons, Duffy did not take the Des Moines job and on November 5 was hired as the Brewer manager for 1912. It was reported Duffy would be the highest salaried manager in the minor leagues, with a reported salary of $7,000. Hugh Duffy was extremely popular in Milwaukee, to the point of being idolized. Ironically, Duffy had been the manager/president of the Western League Milwaukee Creams in 1902 and 1903, the club that did battle with the American Association Brewers. Charles Havenor was part owner and president of the American Association club in those years. However, it was reported Duffy and Havenor had remained close friends despite the baseball war. Just before the 1912 season started Charles Havenor became seriously ill with pneumonia. By April 1 he was so ill not even his closest friends were allowed to see him. Havenor's health had not been good for a while and in the winter he took a trip south and then to Panama for a change of climate. He returned, apparently in good health, but did not have his usual snap and vitality. In late March the Brewer boss made a trip to Athletic Park at Eighth and Chambers to direct workers in clearing snow from the grounds. From this time outside he came down with a severe cold, which developed into a case of pneumonia over the weekend. On Monday he was showing signs of improvement, but suffered a relapse and got much worse. Charles Havenor passed away at his home at 275 Tenth Street (later re-numbered 953 North 10 Street) at 7:40 in the morning of April 3, 1912. 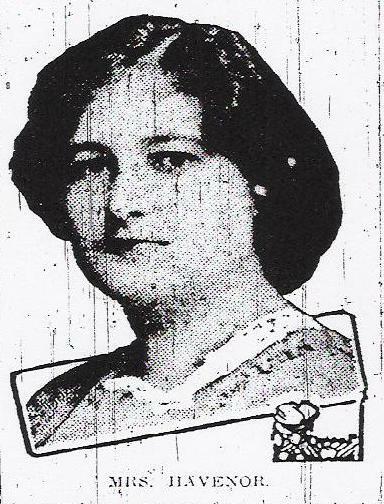 He was survived by his wife, Agnes (née Malloy) Havenor. He would be buried in the family lot in Berlin, Wisconsin. Charles' widow now became sole owner of the Milwaukee franchise. On April 8 she was elected president of the Brewers. 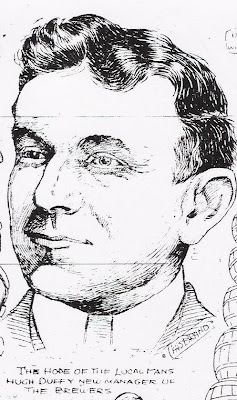 Charles Moll, who had a lot of experience as president of the Wisconsin-Illinois League, was appointed the personal business representative of Mrs. Havenor. Hugh Duffy was, of course, to continue as team manager. The Brewers did not play well for Duffy, and by July it was rumored he was looking for another job after the season. It was said he was disappointed and hampered by the new ownership of the Brewers. Duffy admitted he had been approached by International League clubs, but denied there was any friction between himself and the Brewer owners. Agnes Havenor, for her part, insisted that Duffy would be back in 1913. Never in the history of the club has the Milwaukee team made so miserable a showing, as during the present season. And I want to emphasize the fact that our pay roll has been higher during the present season than any preceding season since the club was organized. Meanwhile, as the team lost game after game, I began a most careful study of its personnel and the methods used in its handlings. During the past two months, especially, the team has come more under my direct supervision and I believe a decided improvement has been shown. We have some exceptionally good men in the team, and others will be added before the next season opens. With a restoration of the snap and enthusiasm so necessary to a winning team and under a manager whose heart will be with his team "in the west" we will play ball hereafter. I want a manager for the Milwaukee team who can and will "make good" in Milwaukee and I have in view the right man for the position. In response, Duffy resigned rather than play out the remaining few games of the season as a lame duck. The writer has been with Duffy all along, knowing that he was working like a Trojan to give Milwaukee a winning club. The team he took hold of this spring was a joke. Every critic in the circuit, outside of Milwaukee, doped it for last place. Unfamiliar with the players, Duffy did not know his weak spots until the season was several weeks old. As soon as he saw the flaws he began to get men to replace them. He picked up several clever youngsters and right now there is not a club in the American Association that has as many high class youngsters as Milwaukee. Getting right down to tacks, Duffy has done wonders in the short time he has been here and letting him get away is absolutely the worst blunder ever made by the Milwaukee management. *Billy Clingman, 1902 manager, 66-75 record; Jack Doyle, 1907, 71-83; Barry McCormick, 1908, 71-83; John McCloskey, 1909, 90-77, 1910, 76-91; Jimmy Barrett, 1911, 79-87. The Milwaukee Journal reported Duffy's salary for 1912 had been $7,000. His contract for the next season was reported to be $4,000 in salary and 10 percent of the profits. Duffy turned this down and demanded $5,000 and ten percent of the profits. Management refused this counter-offer. As the Brewers had always been a profitable franchise, even with second division clubs, the Brewers' offer would probably mean a much higher salary for Duffy in 1913 than he had made in 1912, the Journal believed. The newspaper did give this so true editorial: "But whatever the facts, there is no doubt that with friction existing between the owners and management the only step is to get a new manager. Unless manager and owner can work in harmony, Milwaukee will have to wait a long time for a winner." Hugh Duffy, before taking off for his home in Boston, issued his own statement the next day. He called the Brewers' statement "in some respects so ridiculous that it really should be ignored, but there are some parts which are libels and which as a man I can not help taking cognizance of." Duffy took exception to the statement that the Brewers had given him full charge of obtaining players. He said "The fact is there was hardly a time when some one was not 'butting' into the affairs of mine and the money was not there as stated to get men." The resigning manager said when he realized his team did not have the players to compete at the American Association level he had to rebuild with no money. Thus he built gradually and put a team together that could compete. He also objected to being classed as unworthy of being a manager "by persons who have absolutely no knowledge of the game. The story that the team had been managed the last two months by the club directors is so ridiculous that even the baseball fans must know what to expect." Duffy then gave the facts on his salary. He had been engaged by Charles Havenor the previous winter at a salary of $7,000 for the year. When it came time for a 1913 contract he asked for the same salary. The Brewers offer was a $3,000 cut in salary. Duffy offered to compromise to take $6,000 and a percentage on the sale of players. When this was turned down, he resigned on September 19. "The one mistake I made was at the beginning. I should have resigned when Mr. Havenor died." The Brewer management then issued another statement saying that on July 31 they made Duffy an offer on salary and percentage. He asked for an increase in compensation, which was granted, and he accepted these terms. However, he later repudiated the acceptance of those terms and asked for an additional increase. Since the season started the Brewer manager had spoken to Agnes Havenor only a half a dozen times, which management did not consider a harmonious arrangement in regard to a $200,000 investment. So take your choice Mr. Fan. But to our way of thinking it appears funny that Duffy wanted to quit if he received the money he wanted. He likes the town, and he felt confident that with the start he received this year he would have a high class club next season. At any rate the fans are with Duffy, heart and soul. They believe he has been given a dirty deal, and unless Milwaukee has a team up in the first division next season, the owners might as well close up shop and quite. Both George Tebeau and George Lennon, owners of the Kansas City and St. Paul clubs respectively, were loud in their condemnation of the Brewer management's action in letting Duffy get away. They thought it was a blow to the American Association as a whole. Duffy talked with Lennon, who was in Milwaukee, but did not accept the Saints offer to manage there. It was reported Buffalo of the International League offered him their managerial position, and a chance to purchase an interest in the club, only four hours after his resignation had been made public. Several of the Brewer players took exception to Duffy calling the team he took over one that belonged to a lower minor league. One player told a Journal reporter the infield was practically the same at the end as that Duffy took over, as was the outfield, with the exception of Larry Chappell. Only improvements to the catching department and the addition of some arms to the pitching staff had been made by Duffy. An unnamed player said: "I hardly think Duffy thought very seriously just what he was saying when he issued that statement, as he knows himself that the fans will not come out to a ball park just to see the manager. They come here to see us play ball. I have been in the game for some time, even serving a term in the big leagues, but this is the first time I have ever heard of a manager panning his players after leaving his team." Interestingly, a number of well-known businessmen gave a dinner in honor of Hugh Duffy and Brewer general manager Charles Moll at the Deutscher Club on 9th and Grand Avenue the night after Duffy resigned. Duffy was presented with a silver loving cup and Moll was also presented with a token of esteem. Several names were being mentioned as Duffy's successor in Milwaukee, the front runner being Billy Clymer, who won three straight pennants for Columbus in the American Association and one of the most consistent managers in the minor leagues. Clymer admitted to having communication with the Brewers, but said he also had other offers. 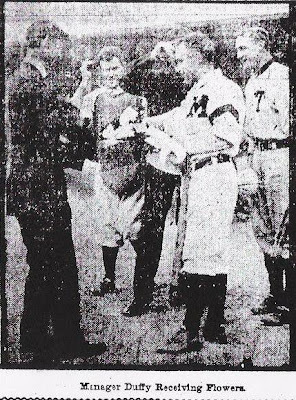 The popular Brewer third baseman and team captain, Harry Clark (right)—who was to run the club the last few games of the season—was also being mentioned. As the managerial situation played out, so did the 1912 season. The season ended September 23 with a 9 to 8 Miller victory over the Brewers on an ideal fall day, "before a vast concourse of empty seats." On September 23 Harry Clark was named to succeed Duffy as field manager for 1913. He had played with the Brewers since 1904 and was probably the most popular man who ever played baseball in Milwaukee. There was little doubt the popular "Pep" was hired to soothe the outraged feelings of the fans in Milwaukee. His salary for 1913 was not stated, but as a player-manger it probably saved the Brewers about $5,000. Clark said of his appointment as manager: "I certainly appreciate the honor in being chosen manager and hope that I will 'make good'. I have always given the fans the best I've had and I will do the same thing as manager." Time would tell how the Brewer management and Harry Clark turned out in 1913. Big Sale at Ebbets Field Flannels!